It’s Lenten time once again! I don’t know what this time of year is like in other cities, but in Pittsburgh, even if you’re not remotely religious, you’re bound to notice when Lent comes around. All of a sudden fish is available in every size and preparation, from church-held Friday night fish fries to fish and mac’n’cheese specials at nearly every bar and restaurant in the area. One of my most frequented Mexican restaurants, Cocina Mendoza, is serving up my favorite of the Friday fish specials: Fish tacos. I didn’t have the chance to try the tacos last Spring, but struck by a need to get in on the fish fun this past Friday, the first Friday of Lent, I wandered over to the restaurant on my lunch break and grabbed a lunch special to-go. Cocina Mendoza is tucked away inconspicuously in the Mt. Lebanon Shops. It’s not my favorite place to grab a taco – that would be Las Palmas in Brookline – but it’s still pretty terrific: fresh, authentic Mexican cuisine at decent prices for good portions. I’ve mostly taken advantage of the lunch specials, which for five or six dollars a piece resemble a full dinner portion more than a light lunch option. As I have trying in the last few months to a) save money and b) eat healthier and lighter options for lunch and dinner, I’ve not walked down to the restaurant nearly as much. I’m glad I did this past Friday. The tacos were delicious. 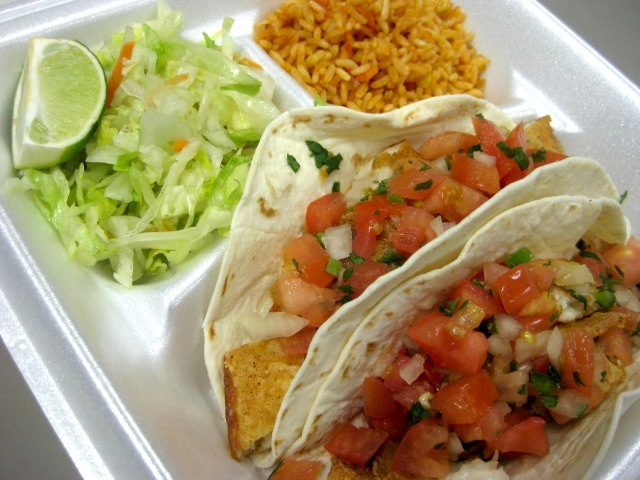 They were two flour tortillas wrapped around several thick slices of fish that were dressed by a fresh salsa. The whitefish was lightly floured and seasoned and fried, a thin, crisp skin giving it prominence even as it was buried under a mound of Pico de Gallo. The bite of the tomato and onion against the mildness of the fish was refreshing, as was the lack of heavier additions, such as cheese or jalapeno or beans. A completely satisfying meal, but far lighter than any of the other lunch options at Cocina Mendoza. Like many fish specials, it was the sort of thing I wished was around all year. Then again, I suppose I’d take it for granted eventually, when the novelty and anticipation wore off completely. Better to have it contained to just this time of year, when I can look forward to that special every Friday, making this March and April trudge toward a reluctant Spring a little more joyful. Posted in Dining Out, Food, Lunchtime! 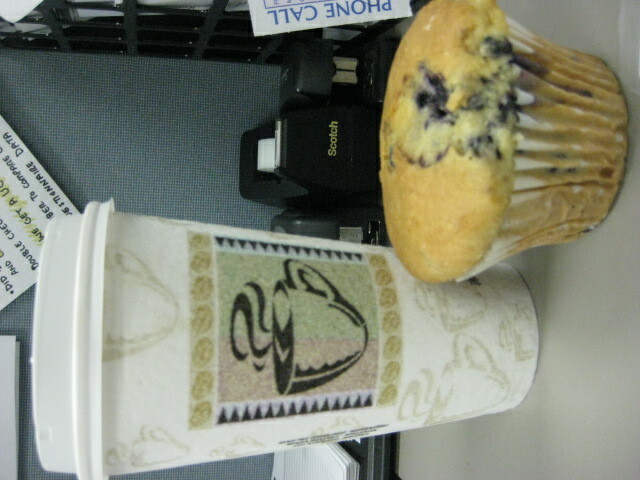 Featured in this picture: A large cup of Kona-blend coffee and a blueberry muffin, both from Graham’s Bakery in the Mt. Lebanon Shops. The picture was taken at my desk, thus the slightly depressing cubicle colors in the background (and the stapler and tape dispenser). I had written last week that I had never had a truly good muffin from a bakery, but I may have been too hasty. This muffin from Graham’s, for instance, was delicious. Like Proust’s Madeleine, it transported me to another time and place in my life, to other muffins I had enjoyed. Something about a blueberry muffin always tastes the same, even when the recipes are radically different, and it’s not just the shared titular ingredient. There’s a sameness that make them comforting far beyond the normal breakfast pastry. That being said, there’s still something about a bakery or store-bought muffin that doesn’t jive so well with me. I think it’s the size. When I make muffins at home, they’re a good hand size, substantial but not overwhelming. Bakery muffins, in particular, tend to have a more-is-better type of approach, which always leaves me with about half-too much muffin. I’m left full of muffin but not satisfied. The Graham’s muffin had one big positive aspect and that was its relatively mild flavor. It was moist and not sickly sweet (although you can get that variation by buying a muffin with icing or sugar crumbs – I opted to take my muffin naked as the day it popped out of the oven, which judging by the taste of it had only been mere hours before), and it didn’t leave me with the vague sick feeling that most store-bought muffins inflict. It was definitely a quality muffin experience, but I’m coming to terms with the possibility that I just don’t like muffins all that much. I refuse to fully submit to that belief, but it’s something to think about. Anyway, if you’re in the Mount Lebanon area, do yourself a favor and stop by Graham’s for a sweet snack. In addition to the muffins, I can recommend the cheese-stuffed croissant (sigh…), the pecan bun, their “French” donuts (crullers… they’re crullers, dammit), and, of course, their heavenly Paczki. Fiftieth Post! Let’s celebrate with a giveaway and list! Yep, it’s our fiftieth post. Feels like just yesterday we were squabbling over a blog name, finding pictures of forks, figuring out what the heck we might write about. Ah, those were simpler times. We’d drive the ol’ jallopey to the local hootenany, a community picnic or barbecue, then have the local artist sketch pictures of our food. Then we’d type out our criticisms of the local farmer’s wife’s apple pie (too crumbly, woman!) and, using a homemade printing press, we’d deliver copies of our newsletter to our reluctant neighbors who believed us to be Commies. Yes, we’ve come a long way since those dusty dirt roads and ink-stained newsletters. We’re riding fast on the information highway, and nothing is going to stop us now! To thank the few of you who read us on a regular basis (and the few of you who read us semi-regularly, and the many who have only dropped in for a post or two), I’m announcing the Fifty Post Celebratory Giveaway: Simply post a comment below with your favorite eating place in Pittsburgh (or one of your favorites, you lovely gluttons) and your email address, and I will pick a winner at random. The winner will receive a dozen homemade cookies and assorted useless trinkets from Dot’s Dollar Store (cheerfull provider of lottery tickets and ugly mugs to the Mt. Lebanon area). I will announce the winner on Monday, November 22. Also, for our fiftieth post, I thought we’d cobble together a list of our fifty favorite eating spots in Pittsburgh. These are not ranked, just an assorted collection of fifty restaurants (and take-out stands and street -vendors) in Pittsburgh worth giving a try. If you don’t live in the South Hills, it might never occur to you to pay a visit to Mt. Lebanon, but I definitely suggest giving it an afternoon of your time. Washington Road is a good starting point. The Mount Lebanon trolley stop lets you off right across the street from several good restaurants, not to mention various shops and boutiques offering an array of goods, from specialty textiles, organic food and nutritional supplements, to fine art, fashionable second-hand clothing, and paper goods. All in all, the business district is only a few blocks, easily encountered in a Saturday afternoon, or split the time between Washington Road and Beverly Road, another business section that features a similar mix of dining and small independent shops. Mt. Lebanon has no shortage of upscale restaurants, but visitors and nearby residents can often mistake its high-income reputation for a lack of lower-priced options, a misconception that when proven false can lead to a delicious and economical dining experience. You just have to know where to go.